I’ll cut right to the chase: I’m bullish on Uprooted‘s chances in the 2016 awards season. A lot factors point to this being the break-out novel of 2015: Ellen DeGeneres snapped up movie rights. The book has been doing absolutely gangbusters on Amazon and Goodreads; as of late September, this has 620 reviews on Amazon, with a 4.5 score. On Goodreads, this has 16,133 ratings (! ), with a 4.21 score. Those are very high numbers for a Hugo and Nebula contender. Compare those to last years Hugo winner, The Three-Body Problem. Cixin Liu’s book is still sitting (after wining the Hugo) at 467/4.4 at Amazon, and 7041/4.0 at Goodreads. Part of the reason Uprooted has been a break-out book is its unusual approach. This novel, from cover to content, has a “fairy-tale” feel without imitating any specific fairy tale. This novel tells the story of a young woman named Agnieszka. She’s taken to a wizard’s tower, where she at first seems to prisoner and then becomes a witch-in-training. We’ve got shades of Rapunzel, Beauty and the Beast, etc. Then the novel shifts gears, and we end up having a confrontation with the corrupted Wood, a kind of moving forest of evil that threatens the land. Uprooted is a wide-ranging book, bringing in plots that involve magic education, romance, and even war. Since fairy-tales are one of the obvious roots of fantasy literature, this book has plenty of appeal for a broad fantasy audience. More than that, the fairy-tale approach make this seem original and important book. It’s very different than your typical epic fantasy, and I think this will follow in the footsteps of something like The Goblin Emperor. If anything, I think this book is stronger, more original, and more appealing than the Addison. Add in that this book seems to be about 10x as popular as Addison’s book . . .
Novik has been writing her well-regarded Temeraire series for years, a kind of Napoleonic wars with dragons series, and this is her first step outside that familiar territory. Hugo and Nebula voters tend to reward authors when they begin new series. Since this is an accessible starting point for new readers, it makes more sense to nominate Uprooted than volume #7 or #8 of Temeraire. Novik does have one prior Hugo nomination, back in 2007 for Her Majesty’s Dragon. A lot of the question for 2016 will revolve around the Hugo controversies swirling in the field. Those uncertainties might substantially change voting patterns. If such changes were out of the equation, I think Novik would be a shoo-in for the Hugo and Nebula. I wouldn’t even be shocked to see Novik win some major awards next year, although we’re probably too early to predict that. Even with various campaigns, expanded Hugo electorates, and other kerfuffles, I think Uprooted has an excellent chance. It’s widely read, original, positively reviewed, and written by an author with a prior Hugo nomination. That’s pretty much the Hugo profile in a nutshell. Good but not great mainstream coverage. The mainstream only tends to push books if they’re by super well-known writers (William Gibson, Neil Gaiman); I think Uprooted was more of a surprise word-of-mouth success. This is as positive a slate of reviews from the SFF world as you’ll see. It’s already being hailed as a “great book,” an “enchanted forest,” as one of the best of the year, as a new and exciting step forward for Novik. I think these reviews are more influential in the Hugo/Nebula process than the mainstream. What’s more important is that is early reviews seem to have led to word-of-mouth success. There will be times a book gets positive SFF coverage but doesn’t break out of the core; Uprooted seems to have a very broad reach. I could have added another dozen links if I wanted to—this book has been broadly reviewed and discussed amongst my fellow WordPress bloggers. As you’d expect, we’re a feisty bunch, and no one agrees on everything. Overall, though, the reviews are highly positive, singling this out as a unique, original, and unexpected 2015 read. Broad reception really helps in the Hugos: the more people read a novel, the more people can fall in love with it. Remember, you get a nomination based on having a highly passionate group of readers, not necessarily across the board consensus. It looks to me that Uprooted has exactly that. My Take: I’ve been trying to add short microreviews of my own to these Review Round-Ups; I think readers need to be able to see my own biases and tastes so they can decide whether or not to trust me. My reading experience with Uprooted split neatly in half: I greatly enjoyed the first part of the book. I thought it’s ability to weave the familiar with the unfamiliar was striking, and drawing on fairy tales without reproducing classic fairy tales was original and exhilarating. I liked Novik’s prose style, and she has some well-crafted sentences and scenes, and the Wood certainly comes across as frightening and sufficiently mysterious. Then the book shifts gears in the second half, and settles into Novik’s more familiar territory, being a kind of war novel between the Wood and the main characters. This part didn’t work for me; I never felt I fully grasped the “rules” of what the Wood or the wizards/witches could do. This made the battle sequences feel incoherent—instead of being involved in the war, I was taken out by the new powers that were constantly being introduced. I imagine that other readers might feel differently; there’s enough romance to keep driving the plot forward, and others might found those battles fun. Individual taste is individual taste; if the book would have ended on page 200, I probably would have given it an 8.5 or a 9, and it would have been my third or fourth favorite book so far this year (the one-two punch of Sevenves and Aurora are currently at the top of my list). I found the second half boring, and that drags my score down to a 7.5. So, what do you think of Uprooted‘s chances? 9 months from now will Novik be celebrating a Hugo/Nebula sweep? I think it’s a strong possibility, but this year is going to be so chaotic that it’s too early to say. There’s a last few pieces of data I want easy access to before I move on from 2015. It’s been quite a year, and I think 2016 is going to be even more chaotic. Not only do we have the specter of further Hugo voting kerfuffles, but 2015 is one of the stronger award years in recent memory. Of the last 7 Hugo Best Novel winners, 5 published new novels in 2015. Bacigalupi, Walton, Scalzi, Cixin Liu, and Leckie are all back at the party with well-received works—and that’s not including past Hugo heavy-hitters like Neal Stephenson (I think Sevenves will be a major player) and Kim Stanley Robinson (Aurora likely for a Nebula nom?). That’s 7 books already . . . and you have to think Pratchett will grab plenty of sentimental votes for the final Discworld novel. Then we’ve got a whole range of other authors with competitive novels in 2015: George R.R. Martin’s A Knight of the Seven Kingdoms (I don’t know whether this is eligible or not as a novel, but if it is, watch out), Ken Liu’s debut Grace of Kings, Brandon Sanderson’s Shadows of Self (without the Puppies, he was awfully close to breaking through for a nom this year; see the stats below), N.K. Jemisin’s The Fifth Season (1 Hugo Best novel nom and 3 Nebula Best novel noms for Jemisin in the last 5 years), the list goes on and on. 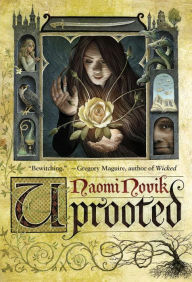 And I haven’t even mentioned potential breakout novels this year, like Naomi Novik’s Uprooted. Throw in the chaos of various Puppy picks, and you’ve got a very murky year coming up. I better roll up my sleeves and get to work! So there’s two sets of numbers I want to look at today: sweep margin in various categories and the Best Novel nominations with the Puppy picks removed. Both will give us some good insight as to what might happen next year. Once again, I’m using the official Hugo stats for this info, which can be accessed here: 2015HugoStatistics. A little hard to parse, I know. Let’s think about Novella first: this chart tells us that Patrick Rothfuss’s The Slow Regard of Silent Things just missed the ballot by a mere 21 votes. So the Puppy sweep in Novella wasn’t particularly dominant; just a few more voters and one non-Puppy would have made it in. Does that mean a category like Novella might not be swept next year? Look at another category, though, like Short Story. Since there are more short stories published in any given year, the vote is usually more spread out, and this time the Puppies were much more dominant. They actually had seven stories that placed above every non-Puppy pick. Two eventually declined, Bellet and Grey, but I’m not tracking that in this study. If we look at the #5 Puppy story, “Turncoat” by Steve Rzasa, it got 162 votes. The highest non-Puppy story only got 76 votes, “Jackalope Wives” by Ursula Vernon. That’s a heft margin of 86 votes—Vernon would have had to double her vote total to make it into the field (before Bellet and Grey declined, but you can’t count on people declining). Possible? Sure. I think the Hugo nomination vote can double next year—but the Puppy vote will also increase. Depending on Puppy strategy, it’s very possible that Short Story or Best Related Work will be swept next year. I’m most interested in Best Novel here at Chaos Horizon; it’s the area of SFF I know best, and what I’m most interested in reading and predicting. Despite all the Puppy picks, Leckie was safely in the 2015 field: she placed 3rd in the raw nomination stats, above 5 different Puppy picks. 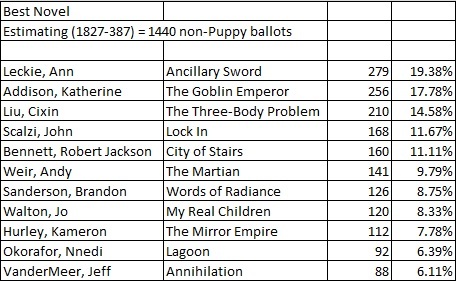 Even Addison’s The Goblin Emperor (256 votes) and Cixin Liu’s The Three-Body Problem (210) beat two Puppy picks, Trial by Fire (199) and The Chaplain’s War. Those two picks, Ganon for Sad and Torgersen for Rabid, are examples of the Sad and Rabid picks not overlapping. The Best Novel category received enough attention, and enough votes, and was centralized enough, that the non-Puppy voters were able to overcome the Puppy votes when they didn’t team up. 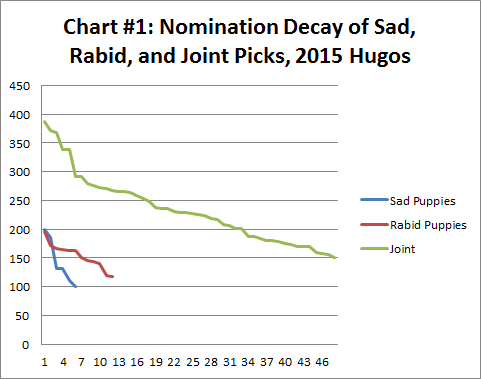 I think that’s a key piece of evidence for next year’s prediction: when the Sad and Rabid picks overlap, they’ll be very strong contenders. If they’re separate, I don’t think they’ll be able to beat the motivated Hugo nominators. We’ll see, of course. That leaves out one obvious point—if the Sad/Rabid picks overlap with something already in the mainstream, that will definitely boost the Sad/Rabid chances. 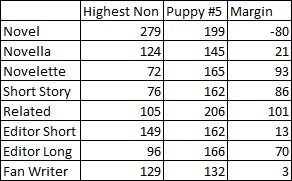 Last thing is to look at the Nomination stats with the Puppies taken out. I need these for my records, because they’ll me to do year-to-year comparisons for authors. What I’m going to do is subtracting all the Puppy picks and then recalculating the percentages. Skin Game got 387 votes, so I’m just going to brute force subtract 387 from 1827 votes and recalculate. Were all of Butcher’s votes from the Sad Puppies? Probably not, but Butcher doesn’t have a strong history of vote-getting in the Hugos. By erasing those 387 votes, I’ll restore the percentages to what they might have looked like otherwise, which will help for my year to year tracking. I like to ask questions like, is Sanderson getting more or less popular? Fun little note: they misspelled Katherine Addison’s name as Katherine Anderson in the Hugo nominating stats. It’s incredibly hard to enter all the data correctly when you’ve got so many data-points! EDIT 9/13/15: The error has been fixed! Check the comments for the full story. Those percentages make a lot of sense. Leckie grabbed 23.1% for Ancillary Justice in 2015, and I don’t think the sequel was quite as popular. A couple things of note: Weir probably would have been ineligible and many Hugo voters knew that. If that wasn’t the case, I expect he would have easily made the top 5. VanderMeer is much lower than I would have expected. Walton did very well (8th) for what was an experimental novel; that means The Just City might have a shot this year. Sanderson in 7th place has been moving steadily up in these Hugo nomination stats; he managed only 4.2% for Steelheart last year. Will his return to his very popular Mistborn universe be enough? I’m still going to predict just outside the Top #5, but it looks like it’s just a matter of time. Okorafor is actually eligible again in 2016 (Lagoon just only came out in the United States). There’s also a lot of experimental-ish fantasy on the list (Addison, Bennett, Hurley); that might speak well of Novik or Bear’s chances in 2016. Well, that brings to an end my 2015 Hugo analysis! It’s been quite a year. I’m going to spend the several weeks doing Review Round-Ups of the big contenders for the 2016, and I should have my first 2016 Hugo/Nebula predictions in early October. My posts have been slow these last weeks—my university is starting it’s Fall semester, and I’ve been getting my classes up and running. I’m teaching Kurt Vonnegut’s Slaughterhouse-Five, Nathanael Hawthorne’s The Scarlet Letter, and Mark Twain’s Adventures of Tom Sawyer across my three classes this week. Strange combination. Toni Morrison, Edith Wharton, and Benjamin Franklin next week! Today, I want to look at category participation: how many people voted in each of the Hugo categories. Historically, there has been a very sharp drop off from the Best Novel category (which has around 85% participation) to the less popular categories like Fan Writer, Fanzine, and the Editor Categories (usually around the 40%-45% range). The stat we’re looking at today is what percentage of people who turned in a ballot voted for that particular category. There are a lot of categories in the Hugos, and it’s unlikely that every fan engages in every category with the same intensity. That stats show that, but the 2015 controversy changed some of those patterns in interesting ways. That’s a very revealing chart. Ignore the top turquoise line for the moment; that’s 2015. 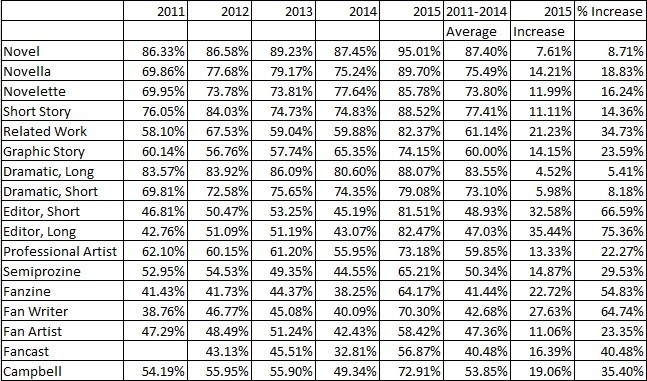 The other four lines represent 2011-2014, and they’re pretty consistent with each other. Participation across categories declines until the Dramatic Presentations, then it declines again, then spikes at Best Professional Artist (who knew), before declining again. Best Fancast began in 2012, messing up the end of the 2011 line in the chart. Historically, the ballot plunges from 85%-90% for Novel down to 40%. 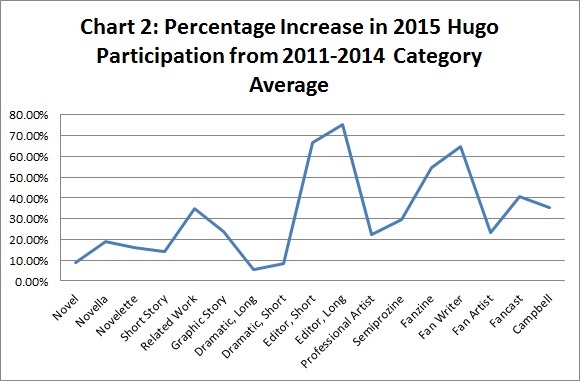 Even the major fiction categories (Novella, Novelette, and Short Story) manage only about 75% participation. Those declines are relatively consistent year to year, with some variation depending on how appealing the category is in any given cycle. So, what did we learn from all this? 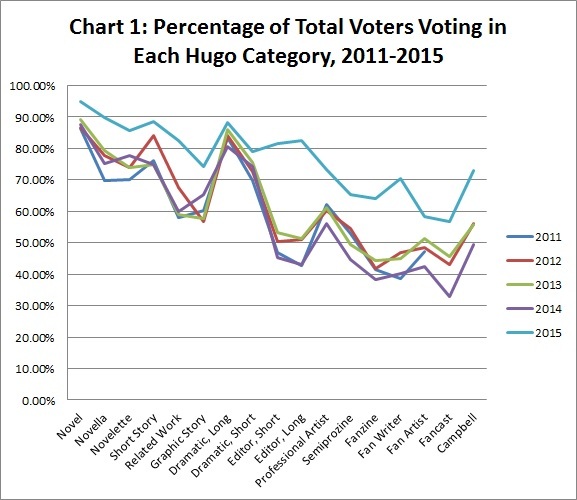 That there was a Hugo controversy in 2015, and that it drove huge increases in participation to categories that had previously been ignored. I think we knew that already, but it’s always good to have the data. Here’s my Excel file with the numbers and the charts: Participation Study. All data on Chaos Horizon is open, and feel free to use it in any wish you wish. Please provide a link back to this post if you do. Otherwise, you might want to check out my similar “Hugo Nomination Participation” study, which looks at the same data but in the nominating stage. It’s linked under the “Reports” tab. Up next: the 2015 nominating numbers!